Bordeaux is a dog. A dog will always fetch the stick or come to heel. Dogs are predictable. But a cat? You never know what a cat might be up to at any given moment—licking its paws or catching mice. Cats are as unpredictable as opening a bottle of Burgundy. You never know what to expect until you pull the cork. Burgundy is a cat…. Vinous, meet Burgfest; Burgfest, meet Vinous. I feel that a formal introduction is necessary since I often name-check Burgfest in my prose. No, it is not an offshoot of the Glastonbury music festival, headlined by Dominique Lafon on the Pyramid Stage and Aubert de Villaine reading poetry up in the Field of Avalon. Instead, Burgfest is the affectionate term for an annual tasting of the applicable Burgundy vintage one year after bottling, the whites assessed in late May and the reds in early September. This year, it was the 2015s’ turn to step forward. Clive Coates MW inaugurated the tasting many moons ago, and members of the group have changed over the years. There are only 10 or 11 seats around the table. Once you have a seat, it is yours until you retire, like the House of Lords but with less wine consumption. I joined in 2013, and since then, Burgfest has become one of the most important tastings in my calendar each year. Burgfest is probably unique in terms of its comprehensiveness. In total, growers, including blue-chip names, contribute just shy of 500 Premier and Grand Crus. While there is, sadly, no Domaine de la Romanée-Conti or Leroy, there are bottles from Comte du Liger-Belair, Jean Grivot, Armand Rousseau, Georges/Christophe Roumier, Domaine des Comtes-Lafon, Dujac and Clos de Tart, to name but a few. The crux of Burgfest is that all wines are assessed single-blind against their peers. The Meursault Charmes are blindfolded and lined up into one flight, the Meursault Perrières into another and so forth. It is the one occasion where I can juxtapose all five Clos St.-Jacques and play “Guess the La Romanée,” which this year I was able to identify. Alas, the prize was not a bottle of La Romanée. Where there are insufficient numbers of wines, flights are combined; after all, assessing every single Clos de Tart from a single vintage is a rather short exercise. In many ways, Burgfest is the most mentally and intellectually challenging of all the tastings in which I participate. You must not only analyze the intrinsic properties of the wine, but also simultaneously consider the terroir—to wit, the expectations of, say, Malconsorts vis-à-vis Aux Brûlées. To ratchet your stress levels higher, scores and their justifications are announced to the group so that results can be pooled together after identities are revealed. All bottles are decanted in an adjoining room by our helper, who decides the order of pouring. As you might guess, a few trips to the recycling center are necessary afterward. The Burgfest tasting essentially strips the fermented grape juice of history, grower, reputation and status, something rarely undertaken in Burgundy, especially now that some of these bottles achieve four-figure price tags. It unfailingly springs surprises and throws curveballs. Illustrious growers may perform less well than expected. A Bienvenue might come across unwelcoming, a Les Amoureuses too salacious; a Les Charmes might not live up to its name. Winemaking faults can be brutally exposed when wines are adjudged against their peers. There will always be wines that ridicule your assessment from barrel, scores that embarrass and leave you perplexed. Did you completely misread that wine in barrel or did it simply change in the intervening period? Usually, it is a bit of both. Burgundy is a cat. 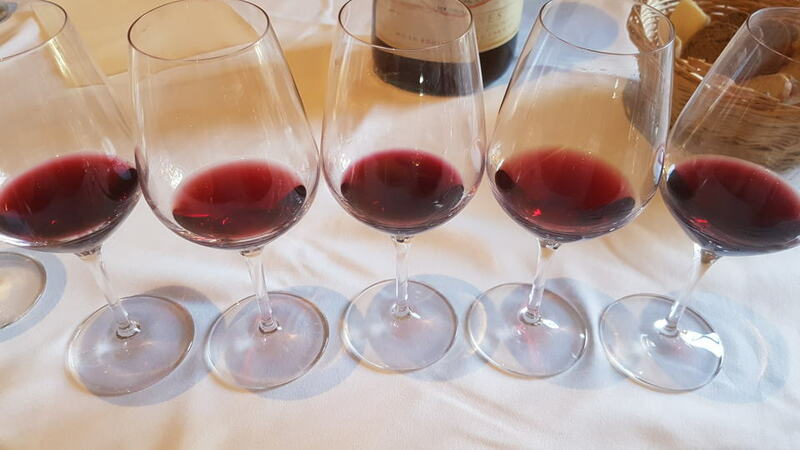 The 2015 vintage was acclaimed upon release, fortunately not meteorologically but verbally this time, so collective expectations were high coming into this tasting, especially for the fêted reds. For growers who had suffered a miasma of hail, frost and depleted harvests since 2010, the dry 2015 growing season came as a godsend. A rapid, even flowering portended an early picking; warm, dry weather prevailed throughout July; and temperatures were one or two degrees Celsius above average but without the heat spikes that discombobulated the 2003 vintage. Growers had to be wary of oidium affecting older vines, although that was relatively easy to remedy. Showers on August 12 and 13 staved off hydric stress and particularly benefited vines rooted in clayey soils. But when it came time to unsheath the pruning shears, some growers found that the vines had not achieved phenolic ripeness and opted to wait. Even before the harvest finished under idyllic blue skies, optimism for a great vintage was high. A few months later, allocations were snapped up by enthusiastic Burgundy lovers, despite concern about increasing prices and apparent insatiable demand, especially from East Asia. With the beginning of the new year, winemakers’ sentiments toward the 2015 vintage seemed to shift in tone. Privately, they began to downplay the hype that surrounded the wines’ release, expressing preferences for the 2014s that purportedly translated terroir with greater clarity than the riper, richer, more fruit-driven 2015s. I was intrigued to find out whether those winemakers had grounds for backtracking, or whether consumers lucky enough to cellar a few cases are currently sitting on a benchmark vintage destined to become the high point of the decade. This tasting provides so much information, so many talking points, that I could go on ad nauseum examining the performance of each and every grower. Allow me to begin by stating something perhaps controversial but irrefutable. On paper, Burgfest is an examination of terroir, since flights are organized by vineyard. The mantra is that great wine is made in the vineyard, a priori, vineyard site is the determining factor. If only that romantic idea were true. If Burgfest proves one thing, year after year, it is that winemakers’ decisions throughout the entire process, from bud-break to bottling, tend to override the sway of terroir. How you prune, whether you de-leaf, whether you farm biodynamically or with chemicals, when you decide to pick, how much you sort the fruit, add stems or de-stem, chaptalize or acidify, how much new oak you elect to use. Sorry to bust the myth, but these multiple decisions shape the wine to a greater degree than whether this vineyard has a bit more limestone than that one. The juxtaposition of these wines at Burgfest reveals so much about decisions made by the winemaker because Burgundies are more sensitive than Bordeaux. Sometimes varicolored flights suggested the wines came from different countries, let alone exactly the same vineyard. See the evidence below. These are the five Clos Saint-Jacques, same walled vineyard and same vintage, all adjacent to each other. To prove my point, this is one flight of wines, same vintage and same vineyard, Clos Saint-Jacques. These differences are highlighted in my reviews and related scores. Overall, however, I found a great deal to be positive about, in the whites and particularly in the reds. Around 220 whites were blind-tasted over four days, including 66 from Chablis. 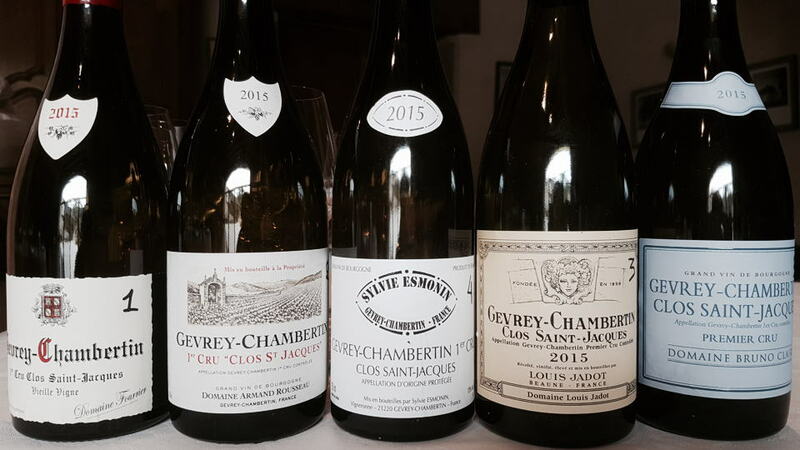 The 2015 whites came hot on the heels of the revered 2014s, praised for their tension and mineralité, a vintage fulfilling all the virtues that winemakers and connoisseurs feel Burgundy should aspire to. 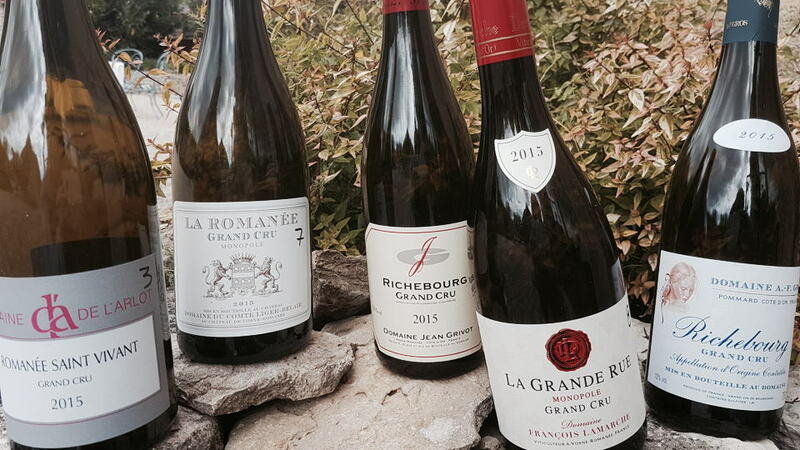 The 2015 white Burgundies were generally well received upon release, though shaded by the 2014s because the warm summer deprived them of the same tension, race and mineral drive. The 2015 whites might yield immediate pleasure, yet not the same intellect or longevity. Based on this tasting, I would suggest that the warmth of the vintage affected Chablis more than the Côte de Beaune. The 2015 Chablis are pleasant wines, but they pale next to their nervy 2014 counterparts. There are exceptions according to grower rather than vineyard location. Domaine Jean-Paul & Benoît Droin performed particularly well, supporting my claim in this year’s Chablis report that they occupy the same tier as Raveneau and Vincent Dauvissat. Talking of which, as is often the case, Dauvissat’s 2015s were difficult to taste because they always shut down and can be very reduced during their first few years in bottle. In fact, I was able to identify Dauvissat’s Les Vaillons merely by the reduction. I was a little vexed by some of the wines from Domaine Gilbert Picq, one of my favorite exponents of steely Chablis unfettered by oak. Conversely, Samuel Billaud and Louis Michel’s Montée de Tonnerre put in strong performances. The flights of Grand Crus did not witness a sudden uptick in quality and again, as discussed in my aforementioned Chablis report, you can argue that their favorable exposure was disadvantageous in this warm season. There are a couple of notable successes, such as Domaine Long-Depaquit’s Vaudésir, but otherwise they lacked the breeding and tension of the 2014s, and in many cases were surpassed by the Premier Crus. 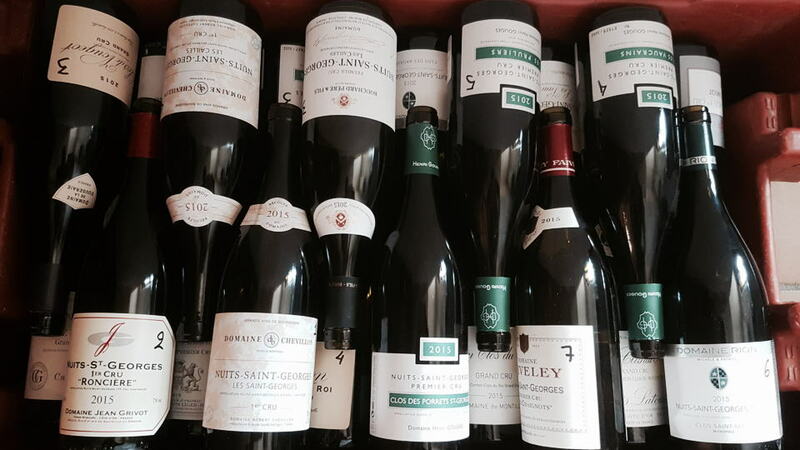 Moving to the Côte de Beaune, the wines withstood the warmth of the summer better than in Chablis. This is partly because many growers managed to maintain appropriate levels of malic acidity despite the accumulation of sugar. Sometimes, Burgfest highlights an appellation that performs better than others. However, within the purview of the whites, this growing season does not single out one over another. Perhaps there is some sway from those parcels situated on more limestone-rich soils that impart higher natural acidity, yet there is no strong correlation. Likewise, those vineyards located on higher contours might benefit from slightly cooler temperatures, though again, I found that this had a negligible affect on final quality. We had quite a comprehensive run through 16 examples from Corton-Charlemagne. Here there was a slight preference from growers on the Aloxe-Corton side of the hill. Montrachet was represented by a quartet whose only under-performer appeared to be from Domaine Marc Colin until it blossomed after one hour’s aeration and began firing on all cylinders, a pertinent reminder that a grand white Burgundy needs decanting. One of the stars in this tasting was Domaine Jean-Claude Bachelet. Based in the village of Gamay, Jean-Baptiste and Benoît Bachelet have a wide-ranging portfolio based around Saint-Aubin and Chassagne-Montrachet. Their wines showed well here and offer good value. They were not the only growers to dispense with the notion that 2015 did not produce high-quality whites. I was also impressed by the wines from Domaine Philippe Colin, especially his riveting Chassagne-Montrachet Les Chaumées. Also, Coche-Bizouard’s Alain Coche (cousin of Jean-François Coche-Dury) produced marvelous wines within the ambit of Meursault. His Meursault Goutte d’Or and Les Charmes were standouts, the former rather overshadowing the far more expensive Goutte d’Or from Arnaud Ente. Another domaine to look out for is Bitouzet-Prieur, whose Meursault Charmes and scintillating Les Perrières brimmed with vibrancy and tension. Among the big names, the 2015 Puligny-Montrachet Les Pucelles from Domaine Leflaive was impressive. It predates the arrival of winemaker Pierre Vincent from Domaine de la Vougeraie, but yet again, it proves that alternative closures such as DIAM have no deleterious affect, at least in the youth of white wines. That brings us to Domaine des Comtes-Lafon, another high-profile estate that disowned natural cork for both their reds and whites. I found the wines a little inconsistent, as I did during my barrel tastings of 2015s. The Meursault Porusots lacked the same complexity and precision as either the Bouchères or the Genevrières. Dominique Lafon’s Meursault Les Charmes left me scratching my head due to an odd vegetal note on the nose, but his Les Perrières showed well and his Montrachet knocked the ball out of the park. We should return briefly to the closures because Burgfest is a perfect litmus test for the ongoing natural cork versus alternative closure debate, not to mention threads on this topic on the Vinous forum. Many Burgundy growers have accepted DIAM as their alternative closure of choice; both Domaine Leflaive and Domaine des Comtes-Lafon have been using it since the 2014 vintage. We logged closures after each flight had been appraised and readers will find them indicated in the tasting notes. A sign of the times was that like last year, all four Montrachets tasted were closed under DIAM, and of the top ten highest average scoring Chablis Premier Crus, only three used cork. We found the same ratio for Chablis Grand Cru. Analyzing the white wines in total across Chablis and the Côte de Beaune, 85 out of 226 wines, or 37%, were under DIAM. Of course, that figure was skewed by the growers in question, but such a high percentage would have been unthinkable just five or six years ago. To offer a balanced view, the incidence of TCA also appeared to have dropped. Many growers at this level are willing to pay more for higher-grade cork, often checked by the manufacturer and with a guaranteed percentage taint-free. Across both whites and reds, there were only four or five incontrovertible instances of TCA and the same number of suspected, marginal cases. Whether the use of DIAM reduced the incidence of premature oxidation, we will have to wait and see. I do not attribute type of closure to be the sole cause of premature oxidation, but rather a significant contributor amongst a combination of factors that, amongst others, include the change hydraulic presses to pneumatic, lower levels of SO2 and less exposure to oxygen during the vinification process. Besides removing the TCA factor, I don’t think DIAM does any harm and I welcome its increasing popularity, especially among the more famous growers. Another factor that affects both whites and reds is reduction. This is a topic that I have written about many times before. It is certainly an obstacle when assessing wines blind. You have to make a judgment on how fixed any SO2 is, and whether you believe it will dissipate with aeration and/or bottle age. Concealed grower identities make this a challenging exercise, since some winemakers are known for making reduced wines that reward cellaring, so that the SO2 eventually blows off. Vincent Dauvissat and Henri Gouges are two examples, or even JJ Prüm in the Mosel. The problem is that consumers are already opening many wines, even at this level, as a cursory glance at a wine list in a Beaune restaurant will attest. How many times will a customer order a bottle in advance, so that the sommelier can decant it an hour or two before serving? The answer is “very few.” Where the bugbear of Burgfest was once TCA, today it is reduced wines. Part of the reason is that some domaines are changing to alternative closures like DIAM and not reassessing their use of SO2, especially just before bottling. Burgfest reconfirmed that the reds have the upper hand over the whites and that the Côte de Nuits is where 2015 reaches its many peaks. The distinction between appellations is more tangible with respect to the reds than the whites. In the Côte de Beaune, the standout flights came from Clos des Chênes and Les Caillerets in Volnay and were quite clearly higher in quality than vineyards on lower slopes. The pool of 2015s from Pommard was a little too small to draw concrete conclusions, though I was pleased to see a strong showing from Domaine Launay-Horiot’s Clos Blanc, pilot-turned-winemaker Xavier Horiot managing his vineyards as well as he once flew jet fighters. Too often overlooked by Burgundy lovers, the flights of Nuits Saint-Georges confirmed that this appellation probably represents outstanding value. The flight focused on the southern sector around Prémeaux-Prissey was a nice surprise. Its vineyards do not have the cachet of those to the north of the village, yet quality is certainly high from growers such as Domaine de l’Arlot and Michèle & Patrice Rion. Generally, Chambolle-Musigny performed extremely well, which is unsurprising, since its more opulent style matches warmer vintages, whereas the more structured Morey-Saint-Denis did not sit quite so comfortably. Gevrey-Chambertin was variable. Personally, I found a lot to admire around the triumvirate of Les Cazetiers, Lavaut/Lavaux-Saint-Jacques and Clos Saint-Jacques, Premier Crus cooled by air funneling down the Combe de Lavaux. (Why did the INAO in 1936 decide to give Grand Cru status only to vineyards conjoining Chambertin rather than those with clear geographical advantage?) In fact, the average scores for these three flights were higher than those of the Grand Crus except for Clos-de-Bèze and Chambertin. Predictably, Clos Saint-Jacques showed strongly. The two standouts are from Armand Rousseau and Bruno Clair, the latter perhaps offering the best value for the money. Last year I was able to identify all five correctly, but this year I conflated these two growers, principally because they are so damn good. Charmes-Chambertin is variable and the grower seems to be the main factor here, more than in other Grand Crus. Between Chambertin and Clos-de-Bèze, I would probably lean toward the former, thanks to the strong showings from Rousseau and J-L Trapet. As expected, Christophe Roumier and Mugneret-Gibourg excelled in Ruchottes-Chambertin, but hats off to Château de Marsannay. They had an up-and-down performance in 2015, but their Ruchottes-Chambertin must surely represent the best value from this Grand Cru. While Chambertin Clos-de-Bèze offers exceptional wines from the likes of a resurgent Domaine Robert Groffier, Chambertin itself provided the real stars, not least a truly magnificent Chambertin from Rousseau, closely followed by Jean and Jean-Louis Trapet, rapidly becoming one of my favorite growers in the appellation. 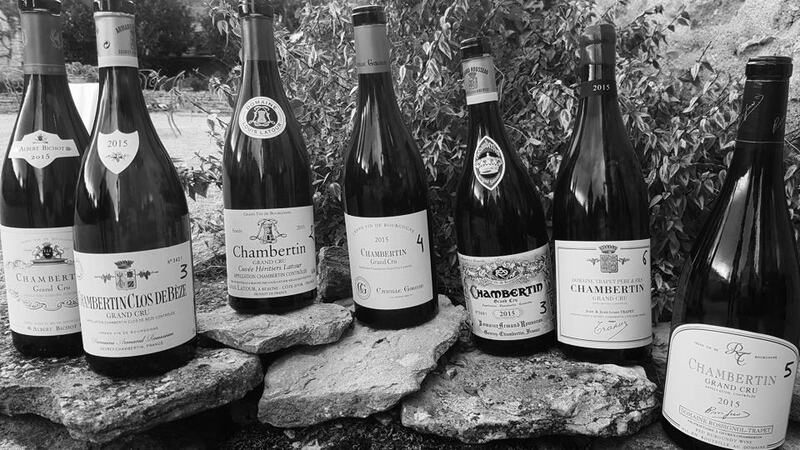 Their Latricières-Chambertin is also a knockout. The appellation of Vosne-Romanée/Flagey-Echézeaux was consistent as expected and provided several astonishing wines. The final flight, a mouthwatering beauty contest of Richebourg, Romanée-Saint-Vivant, La Romanée and La Grande Rue, was mesmerizing. These wines had vowed to end Burgfest on a high. Even the Romanée-Saint-Vivant Les Quatre Journaux from Louis Latour, a producer to whom I have meted out criticism in recent vintages, put in a creditable performance. Elsewhere, I was pleased to see Coquard Loison Fleurot showing well among strong company, thanks to a brilliant Echézeaux that could be even better than their Clos de la Roche. Having rhapsodized over the “CLF” 2016s from barrel, it is reassuring to see that they were no flash in the pan. Also, kudos to Domaine d’Eugenie. They often get a hard time from Burgundy purists who cannot forgive them for stepping into the warm shoes of much-loved Philippe Engel and then—let’s be honest—screwing up the first few vintages. But winemaker Michel Mallard is as Burgundy as they come, and while the Vosne-Romanée Aux Brûlées came across rather overwrought, the Grands-Echézeaux is as sublime as those that Engel produced in his prime. The singular wine that (adopting my best Michael Caine accent) “blew my bloody doors off” came from an unexpected source. The 2015 Richebourg from Domaine A.F. Gros is an astonishing wine, probably overlooked by label hunters flogging their children’s toys on eBay to pay for a bottle of DRC or Leroy. It was astonishing. More fool me for not predicting how this would blossom when I originally tasted it in barrel, when this cru sometimes comes across as excessively oaked. I confess that I mistook it for Etienne Grivot’s Richebourg due to the new oak and purity. Perhaps caught up in the euphoria, I suggested that it was a perfect wine, but on reflection, upholding my rule that a perfect score must be given without a scintilla of doubt, Caroline and Mathias Parent will have to settle for the 99 points that I originally wrote down, and take solace that it was my joint highest score of the entire tasting. And the other? The other is the sublime Musigny from Domaine J-F Mugnier. It may well be the greatest wine that Frédéric Mugnier has ever made, and it comes within a whisker of perfection. All he has to do now is put it on the market. Any takers? Burgfest always reveals new names that previously flew under my radar. There are probably already too many Magniens in Burgundy, but let me introduce Domaine Henri Magnien. This estate was founded in 1987, when Charles Magnien took over from his father, François, in 2009. Though Magnien farms just six hectares of vines, it is where you farm that counts, and here we are talking about Lavaux Saint-Jacques, Les Cazetiers, Estournelles Saint-Jacques Les Champeaux, plus a morsel of Ruchottes-Chambertin. The first three Premier Crus in that list were tasted at Burgfest, and they are all on the money. I will be investigating further. Another more established grower, Domaine Bruno Clair, also achieved some of the highest scores with a sensational Bonnes-Mares and a Clos Saint-Jacques. Bruno Clair, together with wingman/sparring partner Philippe Brun, has really stepped up his game in recent vintages. Their rather bucolic, broad-shouldered, tannic wines are now imbued with newfound elegance and precision. Couple that with their portfolio of propitious holdings and you have a domaine that is going in the right direction. Another name that came to my attention is Domaine Castagnier. Jérôme Castagnier is a fifth-generation winemaker and a former professional trumpeter in the Republican Guard, no less. He and Jocelyne Castagnier farm just four hectares of vines, including four Grand Crus. The wines they previously submitted to Burgfest never really warranted superlatives; however, this time their three wines all performed well. The Clos Saint-Denis was absolutely brilliant and, as I remark in my note, one of the biggest surprises of the entire tasting. The flipside is that some wines do not perform as expected. No producer, no wine, is beyond criticism and sometimes bottles simply do not perform on the day, “fluff their lines” when the spotlight is upon them. I could not quite get my head around the Bonnes-Mares from Domaine Comte Georges de Vogüé and, though I thoroughly enjoyed both the Chambolle Les Amoureuses and Musigny Vieilles Vignes, I scored them parsimoniously because at least at the moment, they do not articulate their respective terroirs as well as their peers. Armand Rousseau’s Charmes-Chambertin, Gevrey-Chambertin Lavaux Saint-Jacques and Les Cazetiers failed to impress not just me but others in the group, prompting murmurings of whether the domaine is living on past glories. Then along came their stunning Clos Saint-Jacques, impressive Clos-de-Bèze and majestic Chambertin, and the answer is clearly: “No.” Maybe some of Rousseau’s lower-performing crus just had an off day? I hope you have enjoyed this journey through the 2015 vintage via Burgfest. It is a unique tasting, brutal in some ways, but then again, why should these wines be spared scrutiny when they cost so much money? Burgfest is as much a test of the reviewer as the wine. I always depart humbled but with a deeper knowledge and truer insight into the vintage. Burgfest highlights both the advantages and the shortcomings of tasting blind, but readers often express their appreciation for a tasting where extraneous factors such as grower, vineyard and reputation are taken out of the equation. It is what is in the bottle that counts. At the end of the day, I came away with a positive impression of the 2015 vintage, in particular the reds. Perhaps it has even gone up in my estimation thanks to its newly revealed backbone and freshness. As I said in the beginning, you never know how a bottle of Burgundy will show until you fetch the waiter’s friend and twist it into the cork. Burgundy is a cat. (Thanks to Jasper Morris MW for organizing this remarkable tasting).